Last month, Qello Concerts launched The Doors Digital Festival, an eight-week program during which Qello Concerts will unlock one classic Doors concert film for free every week. After a Tupac hologram was unveiled at this year's Coachella festival (If you haven't seen the video yet, watch it below) most music fans couldn't help but ask the question, who's next? Today's matchup sees two of classic rock's finest go head-to-head as The Who's Pete Townshend tries to windmill his way past The Doors' Robby Krieger into Round 2. Who will move on? Vote now! The Doors Release New Music Video for "L.A. Woman"
It's hard to believe I just typed the words "The Doors release new music video" in 2012. 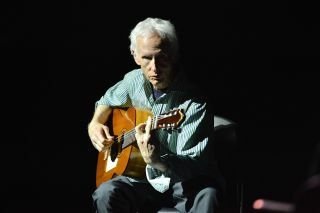 This month's "In Deep" sees Guitar World's Andy Aledort taking a look at the guitar artistry of Doors guitarist Robby Krieger.